This blog post is the continuation of our two-part Stranger Things series. Check out the first post, Your Way Out of the Upside Down: TMF QC. If you happen to be a big fan of Netflix’s hit show Stranger Things, you’ve definitely noticed the countdown to the season two premier ticking away on Netflix’s home page. This countdown also means there are fewer than seven days until the Demogorgon returns to your TV screen. Are you ready? The Demogorgon is the faceless monster that inhabits The Upside Down, the shadow-filled and poisonous alternate universe that has been connected via an interdimensional gateway to Hawkins, Indiana. Unfortunately for the residents of Hawkins, the Demogorgon is attracted to blood… and has a serious appetite. 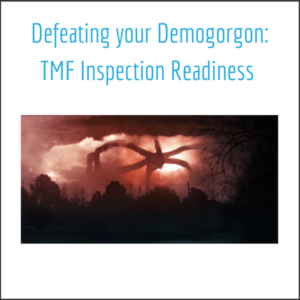 Much as the Demogorgon’s habitat, The Upside Down, reminds us of TMF QC, whereas the Demogorgon (and the terror it inspires) also reminds us of another TMF topic we are passionate about: inspection readiness. In last week’s post we established the foundation of the TMF QC process: the expectations of the sponsor and regulatory authorities. Properly implemented TMF QC should continually provide the study team with assurance that these expectations are being met. Sadly, though, the sponsor and regulatory authorities won’t just take your word for it. Either party may schedule an inspection at any point during the study to confirm your TMF is in pristine condition. So, if your TMF was about to be inspected, how might you react? Would it feel like the Demogorgon was coming to hunt you? Furthermore, per GCP Directive 2005/38/EC: Chapter 4 Article 16, the TMF is expected to be the basis of any inspection conducted by a regulatory authority. Given that a clinical trial can span continents, include thousands of subjects, and hundreds of sites, it is not possible for any inspector to ‘see’ all aspects of a trial. The TMF is the only tool at an inspector’s disposal that can overcome these challenges of time and space. The TMF must tell the inspector the true and positive story of the trial, but will only do so if it is inspection ready. Quality: You and your team have procedurally ensured all sponsor and regulatory expectations are met. Timeliness: You and your team can receive an inspector at any time and at any point in the study lifecycle. You and the inspector have easy and current access to all the TMF documents and can bridge the gaps between widely scattered teams and locations. Completeness: Is it all there? Are you sure? Your TMF must adapt to changes like new documents, new versions, and turnover in personnel. As a bonus – Intelligence: Your team generates actionable insights from data or metrics. These metrics are concrete evidence of your quality, timeliness, and completeness. Even if your TMF is in good health, an inspection can still feel like an encounter with the Demogorgon. However, if your TMF embodies the four characteristics above, you can be confident you’ll escape unscathed. But, beyond the immediate fear of negative inspection findings, a truly inspection-ready TMF has the potential to be much more than an overwhelming regulatory chore. With the right plans and practices, your TMF can become a forward-looking tool that generates insight—insights that can ultimately save the lives of patients and secure the success of your trial.